-Compartimentul calei de bagaje este confectionat astfel incat permite depozitarea tuturor bagajelor celor 23 calatori . -Echipare cu 22 scaune rabatabile + 1 scaun ghid, omologate de Registrul Auto Roman, tapiterie din plus auto cu cotiere rabatabile spre culoar si centuri de siguranta 3 puncte. -Intrarea calatorilor se face pe usa din fata. -Montaj set geamuri TERMOPAN . -Body extension to mount 24 seats. -The body extension is made of steel or steel structure and polyester resin reinforced with fiberglass, it is made using special molds, the cover of the luggage compartment is completely made of aluminum, highly resistant to repeated opening / closing, unaffected by shape-changing over time due weather conditions (freeze / melt cycles), therefore efficient preventing the infiltration of water in the hold. Storage compartment hold is made so allows storing all the 22 passengers luggages. -Thermal and acoustic insulation of the cabin with mineral wool with a thickness of 10 cm. 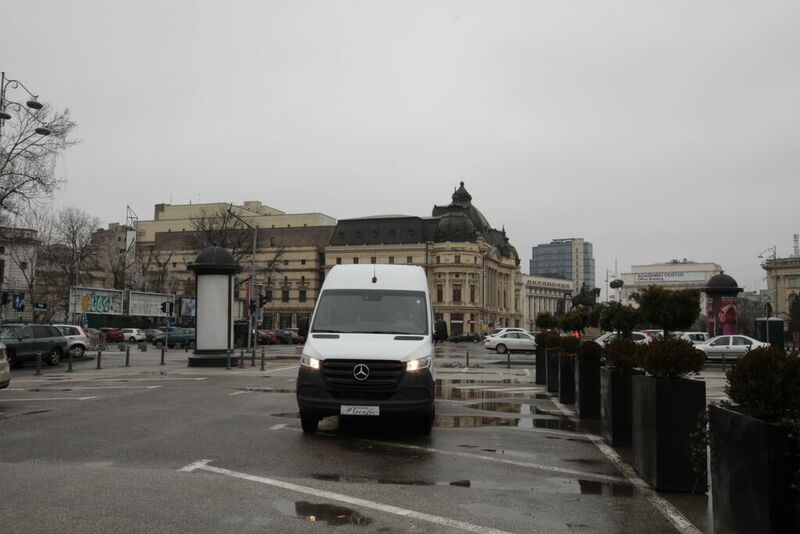 -Equipment with 22 reclining seats + 1 guide seat approved by the Romanian Auto Registry, auto upholstery with folding armrests to aisle and 3-points seat belts. Travelers entrance is through the front door. - 14 mm Tego layered floor, full covered with anti-slip, waterproof and wear-resistant material matching the interior trim. -Seat-mounting metal rails of 4 mm thickness. -Making structural strength in cabin. -Safety glass exit hatch mounted. -Stainless steel climbing handrails mounted. -Eberspacher heater mounted in stationary brand AT 2000 power 2kW. -Yilkar brand air conditioning mounted , with a power of 10kw. -Air conditioning ducts fitted with individual lights and speakers for each row of seats and luggage rack light. Air duct is prolonged and also for the driver. -Free distribution grids for air conditioning in the upper cooling ducts to enable minibus climatisation when individual passengers grids are closed. -Hoses to the air conditioning and heating system are isolated and fixed with plastic and metal clips. -Luggage compartment separate by passengers lounge.